A Sliver of Shadow is the second book in Allison Pang’s Abby Sinclair series and it is a very good follow up to one of my favorite books of 2011. The first book, A Brush of Darkness, easily made it to my favorites list and now the second book is sitting right alongside it. A Sliver of Shadow is book two in an urban fantasy series. That is important to remember when going into this book. This is not a romance book or a stand-alone novel. It is a typical urban fantasy book two which means it is different from the first book and that there is a whole bunch of stuff going on. So much so, I am not going to go into details because then this review would be even longer than my usual reviews – and that’s saying something. But I will say this, once you get past the initial 60 or so pages where there is set-up and chatter and reminders of events from the first installment, the story is quick and interesting and…well, there is a cliffhanger ending but we’ll just talk about that in a sec. Abby is the main protagonist in this series. She is human but she is special. The world you are introduced to in these books is the world of the Fae and Daemons. And there is a unicorn – but Phin is not your typical fairy tale fluffy cutesy unicorn. He is a little crass and tons of fun. He is Abby’s companion and is the source of many of the series’ humorous moments. In the first book, Abby was pretty clueless to her involvement in this world that Allison has created. Oh, she knew that the Fae existed and that she sort of worked for one, but exactly how she fit into it all was a mystery to her. In A Sliver of Shadow, she is more comfortable with her role and she is so much stronger for it. 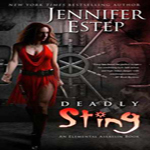 She has guts and heart and is overall very likable and a great heroine to read. I loved how she grew from the first book to this one and how she grew within this one too. She is stronger against the Fae, against her friends and even against Brystion. Melanie is Abby’s best friend and plays a complicated role in this series and world. And by the end of book two, she is still a mystery just a little less of one. I hope we get to dive into her story a bit more in the third book because it really seems interesting. And there are a few new characters introduced in this book and each is interesting…and some have to do with Melanie’s story and some don’t. There is one nasty piece of work then there is the Queen and Jimmy…all very well done. Now on to that cliffhanger I teased about earlier. Yeah…it’s a good one. I think it’s exactly along the lines of Carolyn Crane’s cliffhanger in Double Cross. It’s the kind that really really really makes you want the next book but not the kind that makes you want to drive to the author’s house and tickle the continuation of the story of out her or, even easier, bang your head against the wall. It was really well done and I didn’t see that ending coming at all. 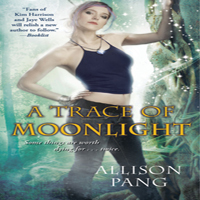 Allison assures me that things will be resolved in the third book, A Trace of Moonlight, coming out later this year, because the current story arc will pretty much wrap up in that one. After reading A Brush of Darkness, I had high hopes for book two and I’m glad to say that for me, A Sliver of Shadow reached my expectations. I will be looking at this book for years to come as it sits comfortably on my keeper shelf next to Abby Sinclair, book one. ‘On sudden impulse, I reached out to stroke the perfect seashell point of his ear. He stilled, silent except for a sudden intake of breath, his eye becoming languid and half lidded. The pulse at his neck jumped, ruining the effect. I jerked my hand away. I hadn’t meant to be quite that forward. 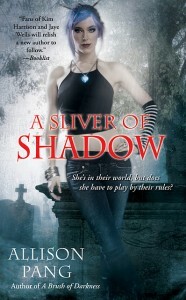 Share the post "Review: A Sliver of Shadow by Allison Pang (Abby Sinclair #2)"
Awesome review, now I really want to read this series!Thanks Julie, I can use some new and good UF on my shelves. I really enjoyed this one too. You were right learning more about Talivar, he was a very interesting character. We have so many new events in this book, and the world was very interesting. I’m glad you enjoyed it as much as I did. can’t wait the third.